I have a problem that I am hoping that someone will have a solution to, or something to point me in the right direction. 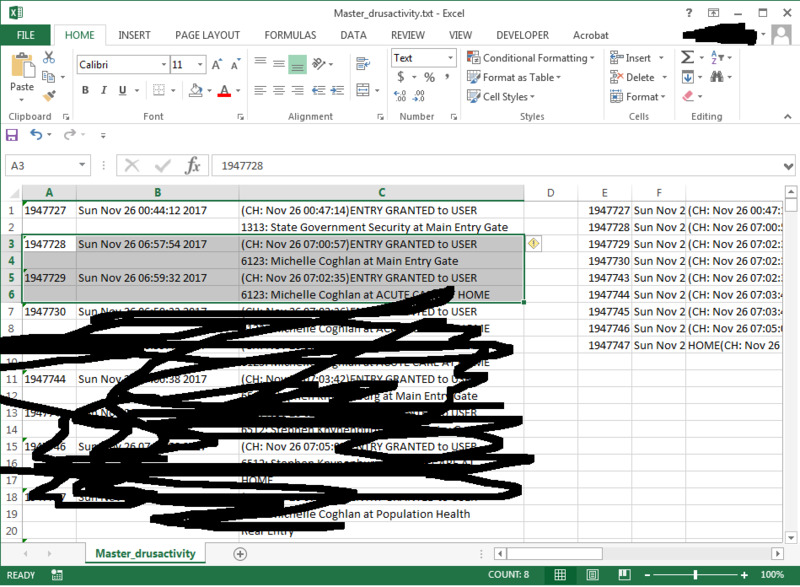 I have a report about 2 000 000 Lines long, its a outputted formatted report from a *nux based access control system, that the client would like changed from what I’ve given them, to something that can be brought into excel or something similar. 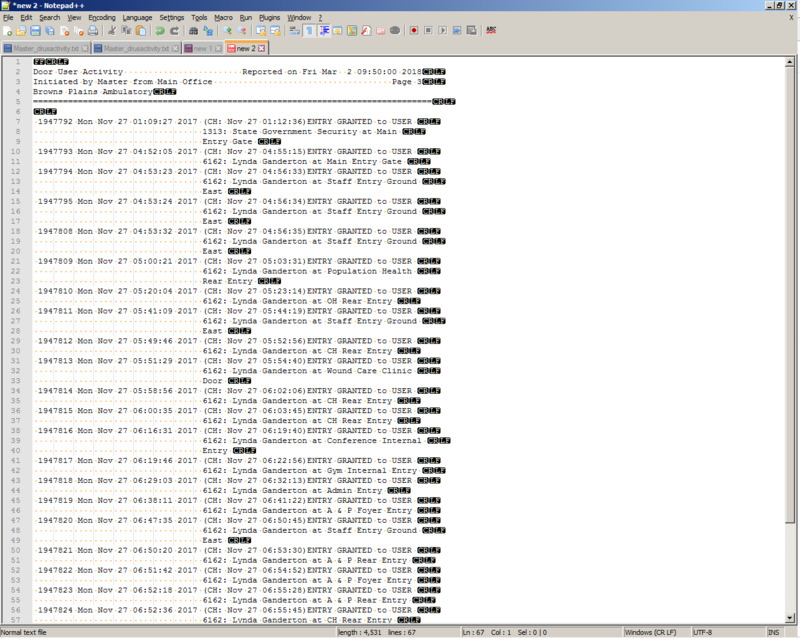 The issue is as follows, the outputted text, can have 1/2/3/4 lines per incident, which means that all I’ve come up with so far is to go through and delete out a lot of the text, I’ve been at it for a few hours, and I am sure there is an easier way to do this. They havent used TAB’s or Commas to delim the fields, rather they have used spaces… Why? I dont know, perhaps its something to do with the export procedure from the *nux box to the windows terminal, I am unsure (Sadly I cannot get back to the terminal to see if there is something else I can get, but when I exported it a few months ago (yes the client got back to me and said they want it in something they can view etc) the only output format available through the terminal was this text file. You’ve given a pretty good example of what you are starting with, but maybe you should give an example (using the same data) as what you want to end up with as well (instead of just loosely describing it: “all I’ve come up with…”). You say the results of your effort should be “brought into Excel or…similar”, so I’d suggest that you also verify that the example transformed data actually imports into Excel cleanly and as you expect. At that point probably someone here will jump in and offer some helpful advice on how to transform your data. Every 80-90 Lines of Text there is a page header as well that I would like to remove, I can simply run CTRL-H and replace the text and make white space and delete it, bit is there a nicer way, or did I hit in on the head the first time? Something that is delimited so I can get some columns going with excel, or such product. Line 4: Cell 7 (Sometimes) (Depends on the length of the verbose output and how many characters it has. If I were you, I’d do it in several steps. First, remove your page header. Since you didn’t provide any detail, you’re on your own on that. Hopefully you know what to do with this. Note: I left out the remaining days of the week, you can easily fill those in between | characters. Exercise for the reader. Third, reformat the data for Excel purposes. That part isn’t so hard, so again, left as exercise for the reader. So the important question is : Do you expect such a text ? So, I tried to determine if this regex S/R could be done in a sensible time, without any bug or catastrophic backtracking of the N++ regex engine ! Consequently, I suppose that your file with 2,000,000 lines should be, correctly, handled, with a recent laptop and OS ! Scott! You are correct I didnt give you the header! I removed Tuesday-Sunday, and left monday only, Still the same result. Thanks for your response as well!! One thing I’ve noticed is that there is a Space before the first 7 digit character, will that upset things? One Line, with comma’s that can be brought into excel nice and neat! I will keep playing, but any thoughts would be appreciated! and I will be sure to save this away if asked again! Note: You can also indent your entire dataset by 4 spaces and it will render like the following, but I find the above method easier (and the colors are often wacky in what follows). Also note: Screenshots aren’t going to cut it. Nobody is going to retype your data from a screenshot to test out a proposed match expression. Ah ! Of course, it’s easy to understand why my regex could not match any string ;-)) Indeed, when regular expressions are involved, even a single space, added or deleted in text, is of importance ! Quite sure that it’s what you expect to, don’t you ? 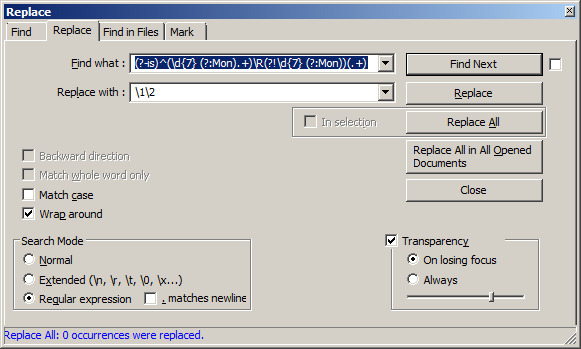 I’ll give some explanations on my regex S/R, in a next post, if the resulting replacement is OK for you ! SO CLOSE! Any thoughts? I could email you the source file if you like? I, also, changed the regex matching the Header, to (?s)\f. *?===\R\R, as there is a pure blank line, after the ===== line ! 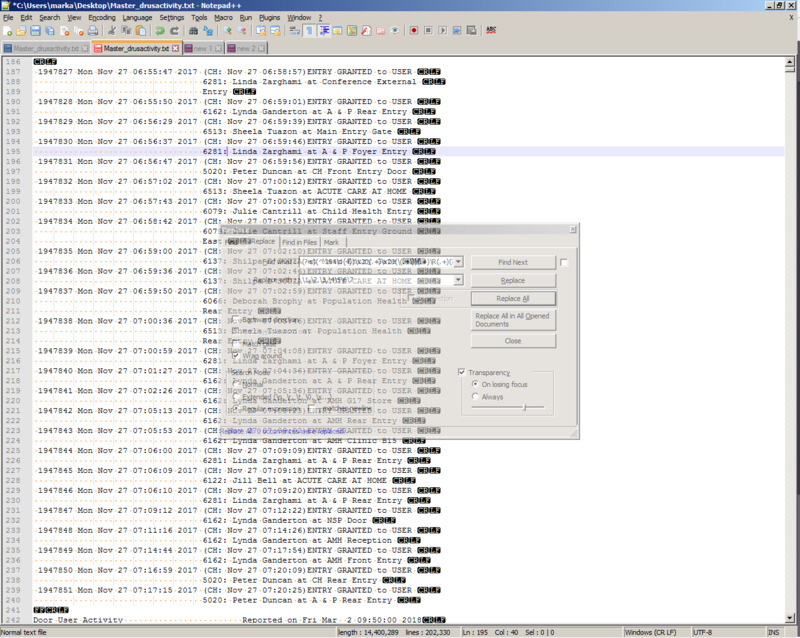 Remember that the Find what: zone cannot store more than 2046 characters ! Thank you so so so Much for your help with this, I truly mean that, it worked perfectly, If its okay, I am going to distribute this way to the supplier of the product so we can use it to make better reports from this program!! !